There is no way of telling the difference between art and non-art merely by looking. During the last few days we have joined a lovely ride into the kitsch, the chaos of memories, and the world of art. 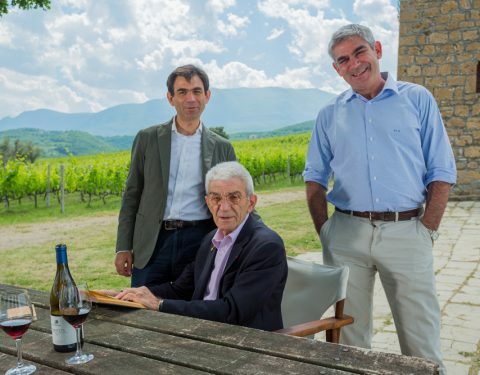 We are living a story that has many stories, uncensored, free and truthful, as our founder enjoys; maybe that’s why Kir Yiannis of Kir-Yianni marks one of the most influential thinkers in winemaking, local governance, business and culture. Once upon a time, a dog and a cheetah undertook the mission as guardians of Thessaloniki’s Mayor’s collection. “Babis and Soula keeping an eye over us!” – someone had suggested – and since then, both porcelain animals stand at the entrance of the gallery. Soula is gazing at a green jungle, while safeguarding the perimeters. 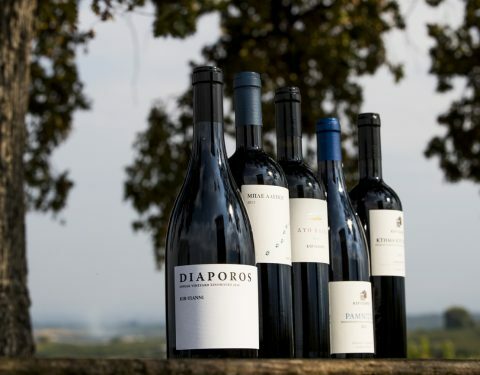 Babis, with his style saying, “Drink, Let not the drink drink you” is devoted to the buffet where the complete Paranga wine collection – white, red, rose, Flowers and sparkling – is presented. This story is seasoned with the richest flavor of Yiannis Boutaris’s openness, self-sarcasm and forbearance. It conveys his unconventional spirit and his comprehension that as “the grape that shone in the sun a few days ago, becomes a pulp and produces dioxide” so, is kitsch, “ugliness going along with the beauty”. This story has an eye identifying this reality; unblocked to the unknown, the unrevealed, and the neglected; critical and yet, ready to inspire from innocent jokes to insightful socio-political comments. It is Noah’s eye when his mission is monitored by the armed forces; it is Orwell’s eye when he sees Lenin admonishing his Animal Farm; it is Paracelsus’s eye when he drinks from Putin’s cup. It is the paradox we all experience, when living in a kitsch world. Yiannis Boutaris confronts it with frankness and wit. Born by some kind of random choice, his collection inherited its owner’s maverick DNA, and was generated by his numerous journeys around the world. Withdrawing such pieces from circulation amused him and ensured, at least in the beginning, that only a few people with a resilient aesthetic constitution would have to endure the challenges of this formidable anthology. 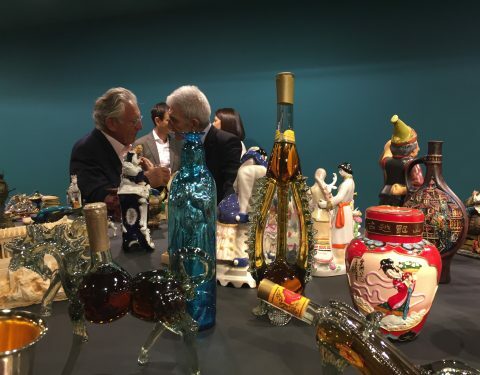 That was the case untill Yiannis Boutaris decided to expose this collection at the Kir-Yianni winery in Yianakohori, where many more discovered its oxymoron charms; the gallerist, Angeliki C. Antonopoulou was amongst them. Together, with the artist Nicomachi Karakostanoglou-Boutari who shaped the space, the art-historian Christoforos Marinos who edited the exhibition catalogue, and an excellent crew of art professionals, they conceived and put together a world of dreamlike images with brilliance and humor. At opening night, Babis and Soula welcomed the distinguished guests, and all of us, thanks to this teamwork had the chance to share old and new memories – uncensored, freely and truthfully. * Putin, Paracelsus, Lenin, Noah, Soula and the other characters are some of the heroes starring in the exhibition’s narratives. ** Kitsch lurks: this story was first published on September 28, 2016, to be censored a day later and republished with the new headline UNCENSORED.